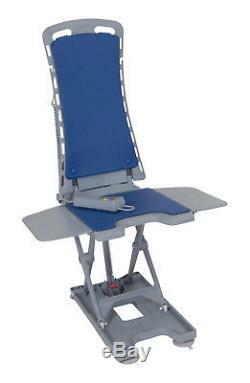 Bath Tub Lift Chair Battery Power Padded Seat Back Rest Mobility Aid Water Proof. The bath lift weighs only 20.5 lbs. Bath lift seat lowers to 2.3. Bath lift seat height reaches 18. The backrest reclines to 50 degrees at its lowest position. Completely tool free set up makes it easy to install and operate. 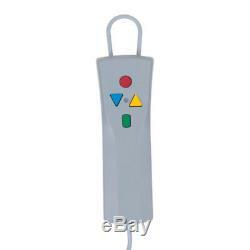 The completely water tight hand control floats, making it easy to access the control buttons while bathing. Two piece construction makes the lift easy to assemble and disassemble for transport. When not in use, back easily folds down for space-saving storage. Padded seat and backrest provides added comfort. 4 quick release suction cups with option for an additional 2 for anti-slip bath base. Actual Product Weight: 20.5 Lbs. Back Of Chair Height: 25.1. Back Of Chair Width: 14.1. Backrest Reclines To: 140 Deg. Batteries: 1 12v 1.3ah. Overall Length Reclined: 32.6. Overall Product Length: 29.25. Overall Product Width: 15.5. Product Weight Capacity: 300 Lbs. Seat To Floor Height: 2.3" 18.8". We offer the best prices around on high quality products. Our E-store includes media such as books, movies, music and games while offering electronics, toys, sporting apparel, clothing, tools, general home, garden items and more. We are always working hard to ensure your package arrives as soon as possible. We do not accept P. Please provide a physical address. ATTENTION INTERNATIONAL BUYERS: All our electronic devices work with 110/120V and will not work in countries where 220/240V is required. We try our very best to make sure every customer is completely satisfied. The item "Bath Tub Lift Chair Battery Power Padded Seat Back Rest Mobility Aid Water Proof" is in sale since Thursday, March 22, 2018. 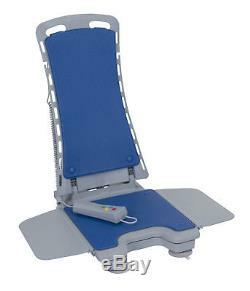 This item is in the category "Health & Beauty\Medical & Mobility\Mobility Furniture & Fixtures\Shower & Bath Seats". The seller is "shopglitz" and is located in Temecula, California. This item can be shipped to United States, Canada, United Kingdom, Denmark, Romania, Slovakia, Bulgaria, Czech republic, Finland, Hungary, Latvia, Lithuania, Malta, Estonia, Australia, Greece, Portugal, Cyprus, Slovenia, Japan, China, Sweden, South Korea, Indonesia, Taiwan, South africa, Thailand, Belgium, France, Hong Kong, Ireland, Netherlands, Poland, Spain, Italy, Germany, Austria, Bahamas, Israel, Mexico, New Zealand, Singapore, Switzerland, Norway, Saudi arabia, Ukraine, United arab emirates, Qatar, Kuwait, Bahrain, Croatia, Malaysia, Brazil, Chile, Colombia, Costa rica, Panama, Trinidad and tobago, Guatemala, Honduras, Jamaica, Barbados, Bangladesh, Bermuda, Brunei darussalam, Bolivia, Ecuador, Egypt, French guiana, Guernsey, Gibraltar, Guadeloupe, Iceland, Jersey, Jordan, Cambodia, Cayman islands, Liechtenstein, Sri lanka, Luxembourg, Monaco, Macao, Martinique, Maldives, Nicaragua, Oman, Peru, Pakistan, Paraguay, Reunion, Viet nam, Philippines, Antigua and barbuda, Aruba, Belize, Dominica, Grenada, Saint kitts and nevis, Saint lucia, Montserrat, Turks and caicos islands.